Soups, chilis, and other savory favorites are our go-to winter standbys. And now—thanks to a trio of hearty comfort food recipes from the ADA's new cookbook Diabetes Superfoods Cookbook and Meal Planner—we can all warm up while staying mindful of our health. In winter, we gravitate toward foods that offer us warmth, sustenance, and, most of all, comfort. From hearty chilis to nourishing soups and other satisfying standbys, we crave feel-good dishes that give us plenty of energy for braving the cold. Unfortunately, traditional comfort foods can be high in calories, fat, salt, and sometimes even sugar. So, if you're one of the 30 million people in the United States with diabetes, you may be wondering: How can I satisfy my comfort food cravings without derailing my diet? Don't worry, say, Cassandra Verdi, MPH, RD, and Stephanie Dunbar, MPH, RD: It can be done. And it can be done deliciously! "There's no rule that says comfort foods have to be unhealthful," says Verdi, coauthor of Diabetes Superfoods Cookbook and Meal Planner: Power-Packed Recipes and Meal Plans Designed to Help You Lose Weight and Manage Your Blood Glucose (American Diabetes Association, 2019, ISBN: 978-1-580-40679-6, $19.95). "If you know how to prepare your favorite comforting dishes using mostly better-for-you ingredients, you can enjoy them with a clear conscience." That's why the ADA's new cookbook Diabetes Superfoods Cookbook and Meal Planner is a great companion for the winter months. You'll find plenty of hearty and nutritious recipes to warm you up without compromising your health. Their secret ingredient? Superfoods, of course. "You've probably heard about the almost 'magical' properties of superfoods," says Dunbar. "Despite all the hype out there, some foods really do pack more nutrition than others. These are the foods you should center your diet upon, whether or not you have diabetes." The authors—both registered dietitians—define a diabetes superfood as a food rich in nutrients that benefit diabetes management or nutrients that are typically lacking in the American diet. These include sweet potatoes; dark, leafy greens like kale, spinach, and collards; cruciferous veggies like cauliflower, broccoli, and Brussels sprouts; lean proteins; legumes; low-fat milk and yogurt; whole grains; healthy fats; citrus fruits; and berries. The Diabetes Superfoods Cookbook and Meal Planner offers over 110 flavor-packed recipes that are simple to prepare and contain one or more diabetes superfoods to maximize the nutrient density in your meal or snack, including cold-weather favorites such as chicken stroganoff, spicy slow cooker chicken, veggie-baked ziti, pecan-crusted pork tenderloin with apples and onions, and many more. Furthermore, the cookbook contains over 40 days of meal plans that incorporate recipes from the book and additional diabetes superfoods into a day of meals—all of which meet the ADA's nutrition guidelines. Ready to eat yet? If so, keep reading for a trio of hearty recipes from Diabetes Superfoods Cookbook and Meal Planner that will warm you up and nourish your body and soul. 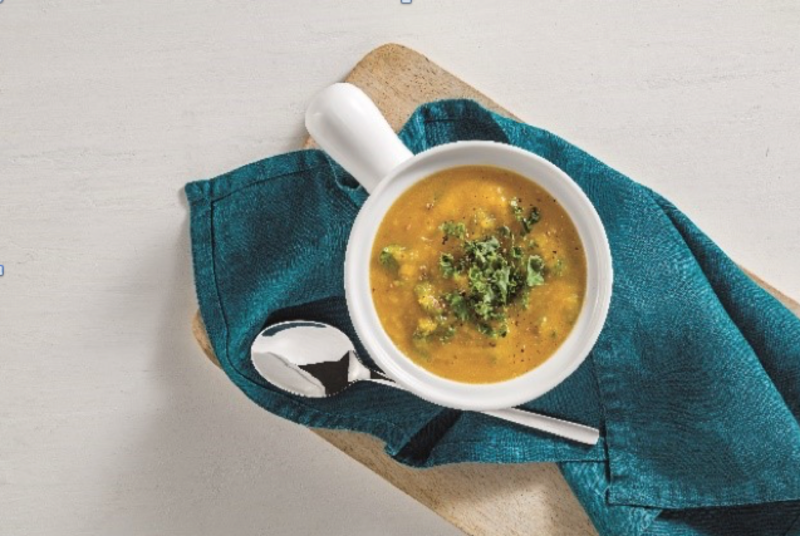 This soup makes the perfect vegetable side dish—it's packed with nutritious vegetables and healthy carbohydrates from the butternut squash and other veggies! 3. Combine roasted vegetables, chicken broth, and water in a large saucepan and use an immersion blender to blend ingredients together until smooth. 4. Heat blended soup over medium heat until heated through. Once heated through, stir in kale and cook until wilted, about 3 minutes. We love chili during those "chilly" months of the year. This simple recipe is a nice balance of veggies, lean protein, and fiber-packed beans. 1. In a large soup pot, heat canola oil over medium-high heat. 2. Add onion, poblano peppers, and turkey to pot. Cook for 5 minutes or until turkey is cooked through and vegetables have softened. Add garlic, chili powder, and cumin and cook for an additional 1–2 minutes. 3. Add beans and tomatoes. Cover pot, lower heat to low, and simmer for 10 minutes. 4. Stir in pumpkin and vinegar and simmer for another 5 minutes. 5. Top each serving with a dollop of nonfat, plain Greek yogurt and 1 Tbsp shredded sharp cheddar cheese (or your other favorite chili fixings)! Serve up these tender meatballs for a fun twist on Italian night! 2. Place all meatball ingredients, except cooking spray, in a large mixing bowl and mix together thoroughly. 3. Roll into 24 golf ball-sized meatballs (about 2 Tbsp each). 4. Spray a 9 × 13-inch pan with cooking spray and place meatballs in the pan. Bake for 20 minutes. 5. Remove meatballs from oven and serve hot. Enjoy with 3/4 cup whole-wheat pasta and 1/3 cup of your favorite chunky tomato sauce if desired. "The next time you want to indulge in some winter comfort foods, remember to choose lightened up versions of the dishes you enjoy," concludes Verdi. "You'll get all the flavors you love, the satisfaction you crave, and the power-packed nutrition that you can get only from diabetes superfoods." Cassandra Verdi, MPH, RD, is the coauthor of Diabetes Superfoods Cookbook and Meal Planner: Power-Packed Recipes and Meal Plans Designed to Help You Lose Weight and Manage Your Blood Glucose and 21 Things You Need to Know about Diabetes and Nutrition. She is a registered dietitian, writer, and nutrition communications expert skilled in nutrition program planning, content development, and recipe development. She is the former associate director of nutrition at the American Diabetes Association, where she managed and developed many nutrition resources. 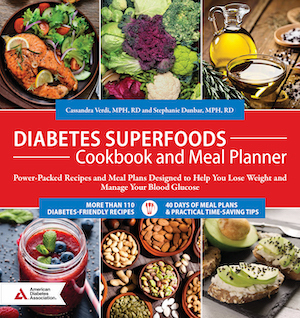 Stephanie Dunbar, MPH, RD, is the coauthor of Diabetes Superfoods Cookbook and Meal Planner: Power-Packed Recipes and Meal Plans Designed to Help You Lose Weight and Manage Your Blood Glucose and 21 Things You Need to Know about Diabetes and Nutrition. She is an author and consultant specializing in health education program development. She is the former director of nutrition and medical affairs at the American Diabetes Association and has worked as a nutritionist providing diabetes education to children, teens, and adults with diabetes. Diabetes Superfoods Cookbook and Meal Planner: Power-Packed Recipes and Meal Plans Designed to Help You Lose Weight and Manage Your Blood Glucose (American Diabetes Association, 2019, ISBN: 978-1-580-40679-6, $19.95) is available from major online booksellers.